hey all.... myself and a couple of nonmembers are planning a quick day run up 4 peaks road, possible lunch at the top or run down to pumkin center for gas, then head back home. think of this is a pre-run for the az 400 later this spring. 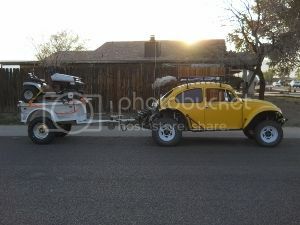 as of today there is a stock jeep, side by side, a quad, possible a Polaris ranger, and myself going. this will not be a speed run, but hopefully a introduction to our great club and its people. the 4 peaks road at 8 am. just off the beeline. cant miss it. this website is most likely the best communication for the run... please feel free to post and I really hope to see some of you on the run. What's the date? Is it going to be this weekend? OPS Sorry shoulda looked at the title, My bad! I did the same thing Kenny, hmmm that means swapping to 930's this weekend and running next...I might be able to attend, let me get with my group and see if anyone is game. I've never been up there so a guided tour is always welcome, radios? my friends only have smoke signals, but I have 2 radios .... I lend one of them out. We all started somewhere, I might just bring my hoe so im not rushed on the rail if I go, are all trails full size friendly? trails are full size forest roads, front side, west , has some rocky spots nothing bad, east side is flat granite crushed.... great views of Roosevelt lake, the valley, and at the top as of 2 weeks ago, there was still pocket of snow. now gone I bet. this run will be perfect for everyones better halves to come along. I do think there will be 3 women/better halves in the group going. due to my work schedule, this is the only open sat. I can plan this. John... Mike and you run the same radio's. Mike run's a hand held that is about 5w. John... you need to fix your raido. the road is wide open... I love it in the rail.... its like driving on ice. I would be cautious the first few times in the Baja.... I am still learning how to drive that car sideways. Bill over at az trans exchange has a couple of radios, couple of hard mounted, and a couple of hand held, should give him a call. Mike .... you need to get with John and get one of his external speakers for your New vertex 3200 ... the speaker in the unit is too small and you wont be able to hear it. I need to get with you about how to set up a ground plane for your antenna. cant make this run.,.. Something came up.